Whether it involves setting the clocks an hour forward to welcome spring, or getting an extra hour of sleep to transition to the darker winter months, daylight savings time can impact your entire family’s routine. Those 60 extra minutes of slumber may not seem like much, but a toddler or a school-aged child can take a while to adjust to a new sleep routine. Luckily, there are things you can do to minimize the impact on your family’s schedule. Trying to get your toddler to bed at 6:00 p.m. instead of 7:00 p.m. can be a trying experience. To get your little one used to going to bed a little earlier or a little later than usual, it's a good idea to start transitioning your child to an earlier or later bedtime. Try to get your little one into bed 10 to 15 minutes earlier or later (depending on which way the clock is going) in the week leading up to the time change. This way, his body clock will have made some of the adjustment already. While your child may not actually go to sleep until his regular bedtime, you are encouraging his body to relax a little earlier than usual and this will lead to falling asleep earlier too. Trying to wear your child out in a bid to get him to sleep earlier is not encouraged. Overtired children often actually take longer to fall asleep and may even resist sleep completely. Keeping younger children on track with naps following the time change will allow them to better transition to their routine. Even if your little one doesn't seem ready at first, encourage quiet time and rest at 2:00 p.m. if your child usually naps at that time. If your child keeps waking too early, ensure that he understands that you don't consider this an acceptable time to start the day. Encourage him to doze but if he really wants to be awake, encourage him to stay in bed doing a quiet activity. 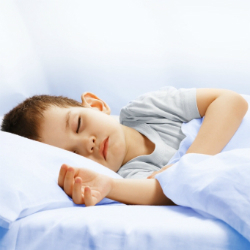 Do your best to protect your child’s sleep time during transitions to daylight savings time. Ask family and friends not to call after a certain time and encourage the rest of the family to try and limit noise, and if possible, adopt a similar transition as your child. Develop a pre-sleep routine: bath, brushing teeth, pajamas; kiss goodnight and a bedtime story. Any activities before going to bed should be quiet ones. Optimize your child’s sleeping environment by ensuring his room has a cooler temperature, is dark (you can always use a night light if your child is afraid of the dark) and quiet. Your child shouldn’t go to bed hungry; a light snack will help but don’t put him to bed if he has had a heavy meal within three hours of sleep.